The group’s top managers and executives attended the inaugural event in Shanghai on November 5-10, 2018, where they signed deals with Chinese leading companies in the automotive, aerospace, energy and steel sectors, including steelmakers Baowu Steel Group, Benxi Steel Group and Fujian Special Steel. China's Head of State Xi Jinping opened the event with a keynote speech calling on attendees to work together for an open global economy that is innovative and inclusive. The more than 3,600 enterprises present took up this challenge, taking the opportunity to share high-end intelligent equipment solutions for different industries across the exhibition space. The Fives’ booth showcased its cutting-edge and environmentally friendly technologies and digital solutions for ultimate steel-processing performance. Fives’ digital solutions for the steel industry enable the automation of process controls and real-time quality management. ‘The cooperation agreements signed with Chinese steelmakers will allow us to jointly develop in a win-win spirit the steel-making technologies of the future for the Chinese market as well as for global export,’ says Guillaume Mehlman, President of the Steel and Glass business lines at Fives. “Industrial intelligent solutions will be a driving force for steelmakers to meet the requirements of a green city”, highlighted Stéphane Mehrain, Vice-President of Fives’ Steel business line. 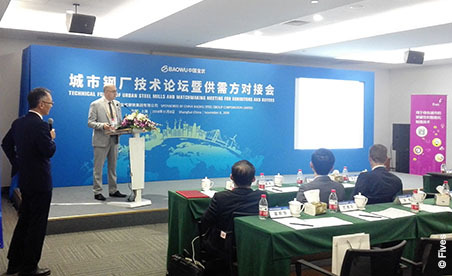 His presentation during the technical forum on urban steel mills, organized by China Baowu Steel Group, covered eco-designed equipment, smart lines, including disruptive heating and cooling technologies, and fully automatic process management. The presentation made a big impact on more than 100 experts and generated many questions. More about Fives’ digital technologies for the steel industry. Fives has been present in China since 1890. It has nine legal entities and workshops in the country with more than 500 employees. As an industrial solutions provider, the group has been very active in the aerospace, automotive, intralogistics, glass, sugar, energy, and steel industries in China for decades.